Primozone is a modern and recognized ozone generator supplier who not only supplies ozone generators but also designs complete ozone water treatment systems. We know ozone and can be your partner in designing a complete and efficiently working ozone generator system for most municipal water treatment issues. 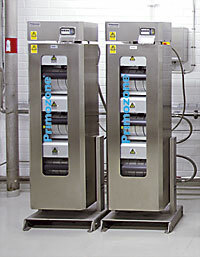 The Primozone® technology allows for solutions that are cost effective. Our ozone generators produce a high concentration of ozone using a comparing low amount of energy, which makes the life cycle cost surprisingly low. The Primozone ozone technology is different in many ways which means that we, for example, can offer maintenance free and high performance ozone generators. As your partner Primozone can design a complete and optimal ozone solution for municipal water treatment. We supply complete ozone water treatment systems with everything from oxygen generators to dissolution modules and ozone destruction. Primozone’s ozone treatment solutions were specifically requested by both Yorkshire Water and AECOM, the design/builder of Acomb Landing, as the best of all available options. Read more about the Primozone ozone solution at Acomb Landing.